Say what you like about Tony Abbott but he’s a bugger to follow. Harder than eating red beans with a pitchfork. He’s always been a lair but now he hoons, fishtails and careers all over the tarmac in his own death-wish demolition derby. Has he finally crashed and burnt on his mission to save ‘The Bali Nine Pair’ Chan and Sukumaran from Indonesian justice? Shopped by Federal Police who have yet to explain why, the youngsters fell victim to operational ‘information sharing.’ Conflicted from the outset, clumsy, confused, the Abbott government had little chance of intercession later, despite our hope and media hype. 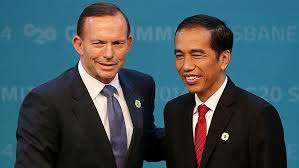 Abbott’s threat to cancel aid, however, served only to harden Indonesia’s intransigence. Now the PM could help himself by answering a few basic questions. Why did we set up a drug bust with a nation with a death penalty? Did we need a favour in return? Is he happy with his negotiation style? The PM can be abrasive. European leaders should turn back refugee boats; follow his lead, he lectures, leaving Julie Bishop to suggest lamely that her boss was merely offering his experiences for others to consider, adding injury to insult. She went on to contradict him, further shredding his credibility as a strong leader. Sent in to the rescue no doubt, Katie Hopkins of Murdoch’s Sun, who has called refugees ‘cockroaches’ rose to the occasion if somewhat lowering the Tone. European leaders are bemused. Yet they can’t help but laugh at the presumption and self-delusion of our Walter Mitty would-be strong man. They see him flip-flop. One minute, we are all washed up; down the debt and deficit gurgler, he wags his finger. Next he’s spending up big like a drunken sailor out on the town but with someone else’s money. Ours. Funds are so low we must scrap Federal literacy support for school kids; but suddenly Abbott stumps up $100 million we don’t have, to build a memorial to John Monash, which, frankly, neither of us needs – in France. Gallic gratitude to ‘our boys’ aside, the French hardly need another war museum, even, as promised, one just pulsing with interactive, hands-on stuff to help the mindless to reflect. Let homeless war veterans sleep on the streets. Let battered wives be forced to stay at home with their tormentors. We can’t spare funds for more refuges. Forget John Monash, the Villers-Bretonneux museum is effectively a monument to an inept Australian PM, desperate to boost his image; hitch his wagon to a star. If his wagon were not a sky rocket without a stick. One moment Abbott’s toe to toe with Widodo next he’s wimped out, settling for a lame, ambassadorial recall for two weeks – a ‘go stand in the naughty corner’ which Indonesia is already laughing off. Being a hypocrite doesn’t help. The PM can go off like a frog in a sock about Indonesian injustice all he likes but he’s connived with Dutton to achieve a Vietnamese refugee turn-back behind our backs. The Abbott government has allowed asylum seekers of all ages to be raped and one even to be murdered. He’s also earned the censure of both the UN for indefinite detention and children in detention. Censure, too from the rest of the world for announcing we are not to be lectured on human rights. Small wonder Widodo thinks he’s a joke-O. With thousands of Australian-bound UNHCR registered asylum seekers marooned in Indonesia at a stroke of the pen by Australia’s 2014 Sovereign Borders law, moreover, Joko Widodo may well have the last laugh. No wonder Credlin went missing in action. Or was just run off the road. His formerly inseparable Amazonian chief of staff just vanished after Rupert Murdoch told Abbott to drop her. Silence prevails. Secrecy is in this government’s DNA, intertwined with dirty tricks, slipperiness and its fondness for lies. Pity. Peta Credlin is a lot easier to look at than her boss. Smarter, too. You can tell she’s been sidelined, sadly, by the PM’s increasingly ill-advised stunts since Rupert’s call; the erratic trajectory of Captain Chaos’ ship snaking this way and that before burning out on re-entry and falling back to earth with a thud. Come back, Peta, your boss is the loaded dog without your leash; your house-training. Stop squandering money on such luxuries as running the country, employing people, and looking after us, advise the Abbott government’s tanks of neo-con artists. Let them buy their own bloody aspirin and paracetamol! Labor will take the blame for all of this for at least the next millennium while professional shakedown merchants scab the rest from the poor and needy. Well, not quite all. The elderly need to be helped to empty their pockets; fork over their savings and anything else of value. Otherwise it’s intergenerational theft. Time for another tank of thinkers to rattle the can it carries for our Neo-con LNP. Pensioners who can’t be put to work at Mitre 10 are to be hit up for their spare change and any coin that may have fallen down the back of the sofa before being forced to give their homes to finance companies. The ‘Australia Institute,’ an oxymoron which bills itself as ‘a progressive think tank,’ will then talk up reverse mortgages, (perverse?) until the elderly cave in completely and hock the family home in terror because they have been conned into thinking they must fund their own meagre pensions. Yet now, suddenly, miraculously, Abbott can afford more troops for his war-gasm in Iraq; funds to give to arborists and others quick enough to stick their hands out for Greg Hunt’s phony ‘carbon abatement’ scheme handout; a quarter of a billion on nannies; a special fence to keep himself safe in Canberra. The list goes on. The man’s a virtual magic pudding mix-master; a genius when it comes to putting the con in Neo-con or looking after his own ends. Yet tragically, there seems to have been little cash splashed where it mattered in his latest, dreadful debacle with the Indonesians where events prove the Abbott government has truly run up its own moral debt and deficit disaster, having burned all diplomatic and political capital pursuing moronic three word slogans, enacting laws repudiating all international obligations. No. Having inflicted calculated cruelty on those to whom we should extend compassion, there has quickly come the point, when the rest of the world will cheerfully tell us to go to hell – however much, we beg their mercy. « ANZAC makes week a long climb in politics.